The Best Players in US WNT History: Who’s #5? Her Story: It’s tough not to put Joy Fawcett higher up on this list, but I like her here at #5. She grew up in California and was a three time All-American at UC Berkeley. She would join the Nats in 1987 and would serve the squad well until 2004. 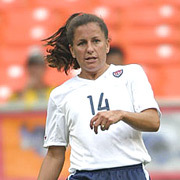 For almost two decades, she would be a constant fixture on the backline for the powerhouse WNT. Her Stats: Fawcett is the fourth most capped player in WNT history with a whopping 239 appearances. She scored 27 goals for the team (2nd most for a defender) and played some of the most tenacious defense in team history. Her amazing ability to shut down her opponents’ best players and her tireless effort on the field make her a US legend. Her Trophies: Fawcett was the only WNT player to play every minute of the 1995, 1999 and 2003 World Cups and the 1996 and 2000 Olympics. She was also a member of the 1991 WC squad that won the title. Thus, when she retired in 2004, she had two Olympic Golds and two World Cup titles. Few WNT players have as crowded a trophy mantle. Her Legacy: Fawcett played physical defense for the WNT and her aggressive style and brilliant marking ability would make her a legend. Sure, she didn’t score a ton of goals (though she did have a good nose for the net on set pieces), but she did consistently dominate opponents’ attack and play a huge role on the US WNT’s greatest teams.